Oregon State University (OSU) has named a professor and chair of the food science and human nutrition department at the University of Florida to head the Oregon Wine Research Institute. As the institute’s first director, Neil F. Shay will help further the partnership of one of the nation’s leading agricultural and natural resources research institutions, OSU, and Oregon’s world-class wine industry, estimated to contribute more than $1 billion annually to the state’s economy. Shay has studied viticulture and enology for a decade and is an award-winning amateur winemaker in his own right. In addition to his doctorate in biochemistry and molecular biology from Florida, he holds master’s and bachelor’s degrees in physics education and zoology, respectively, from the University of Massachusetts at Amherst. His primary research has focused on bioactive compounds in plants. 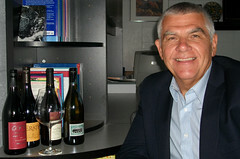 Most recently, Shay’s work has led him to investigate health benefits of grape and wine consumption. “There has been lots of interest generated by the discovery of certain bioactive components in grapes that have beneficial actions on human metabolism,” said Shay, whose studies include the ability of bioactive compounds to lower blood cholesterol and triglyceride levels. As the director of the Oregon Wine Research Institute, Shay will work closely with the state’s robust and innovative wine and grape industry, connecting OSU’s research and extension programs with growers and winemakers throughout Oregon, thus contributing to the economy of the state. He will begin work August 15. “Neil has worked in land grant universities and in private industry with the W. K. Kellogg Institute for Food and Nutrition Research. He understands how to connect research and business in large-scale projects that are results-oriented. We are excited about the vision and passion Neil brings to the Oregon Wine Research Institute and to the industry,” said Sonny Ramaswamy, dean of OSU’s College of Agricultural Sciences. Adelsheim and several other leaders of the Oregon wine industry from throughout the state worked closely with the College of Agricultural Sciences to establish the institute and recruit its director. An earlier search for a director concluded last year without consensus. The industry and the university later redefined the director’s position with increased responsibilities to develop collaborative and interdisciplinary research relationships with other OSU centers and institutes. The seven-member search committee was composed of industry representatives across the state’s grape-growing regions, and faculty from the enology, viticulture and business disciplines. During the candidate interviews, the committee solicited industry input in Jacksonville, Ore., at the Northwest Viticulture Center in Salem, and in the Portland area. “We really valued the major involvement and tremendous feedback from industry, USDA scientists and university researchers. It made the search committee’s job much easier,” McGorrin said. The Oregon wine industry worked with Gov. Ted Kulongoski and the state legislature to make available a special policy option package funding, and has raised nearly $2 million to help cover the institute’s operations for several years, giving the institute a solid base from which to grow. Among the facilities available to the institute is a research vineyard (Woodhall Viticultural Center) and a 34,000-square-foot pilot plant winery where students learn fermentation science firsthand. OSU is home to the Northwest Center for Small Fruits Research, the Linus Pauling Institute (researching anti-oxidants in the diet), the Austin Family Business Program and the Horticultural Crops Research Unit of the U.S. Department of Agriculture-Agricultural Research Service in Corvallis. OSU also runs the Food Innovation Center in Portland. All of these entities work to help Oregon’s wine industry. Additionally, as Oregon’s only land grant university, OSU has Extension Service faculty across the state who provide specialized help with viticulture. According to Ramaswamy, no wine region has achieved major prominence without the ability to identify and research the regional problems it faces in its vineyards, wineries and marketplaces and to communicate that new knowledge to its members. For example, Bordeaux has its Institut des Sciences de la Vigne et du Vin, which coordinates research in four local universities. Burgundy has the Institut Jules Guyot, which coordinates research at the University of Burgundy. The Australian Wine Research Institute has played a pivotal role in the rapid progress of Australian wine. The Oregon Wine Research Institute draws on a wide range of viticultural and enological research at OSU that has grown along with the Oregon wine industry since the 1960s. OSU scientists were responsible for many discoveries important to the industry — isolating the first malolactic bacteria to grow at cold temperatures and low pHs, devising a “lag growth phase crop estimation system” that is now used universally, importing the Dijon clones and many varieties for the first time into the United States, and creating the first International Cool Climate Symposium for Viticulture and Enology in 1984.
tags: "Neil Shay" "Oregon State University" "Oregon Wine Research Institute"